Shrimptoncouture.com has been on-line for about 2 years now! But I have been collecting for years and years before that! what motivated you to go into the vintage business? Honestly, I am a collector first and foremost so the business was always about being able to pare down my collection and at the same time justify buying MORE! I am really great at justifying purchases of vintage! I have always been a clothes-crazy girl and I have always been a label and quality snob and quite frankly vintage enabled me to buy the quality I wanted to wear in clothes at a price I could afford it at, early on. I also quickly learned the appeal of being the girl who "had the only one of its kind." As the years progressed I relentlessly "upgraded" my collection. I would buy better vintage and distribute the old to my girlfriends. Eventually the prices I paid for what I had got a bit out of control and so I started selling off my collection. But only to be able to buy more. It was the concept of $1 in – and about $10 out. I made friends with a few key "pickers" (these are people in the business who source vintage – they "pick" through to find the good stuff) and made deals with them to buy the cream of the crop for a little more than what dealers or store owners would pay them – they loved me for that. I also discovered online shopping but was often disappointed with what arrived. It seemed so hit and miss. As my personal income rose so did my budget for buying vintage and I was able to start shopping current labels as well. This just made me pickier and pickier. I started buying from more established sites online and at some point a light bulb went off and I thought — I can do this better. That's how the website was born. I have been in sales & marketing at some capacity or another for my entire career. I am actually a Vice President and part owner of a company in the commodities industry! So I work a LOT – and I work every day! Just outside of Toronto on a large property where we are slowly renovating a big, old house. This year we are adding a proper studio for my collection & archives, so clients will be able to come in and shop with me by appointment! what's the most beautiful thing you've ever found? I am so lucky to have come across some pretty amazing things but one of my favorites at the moment is a 1930s silk floral gown. 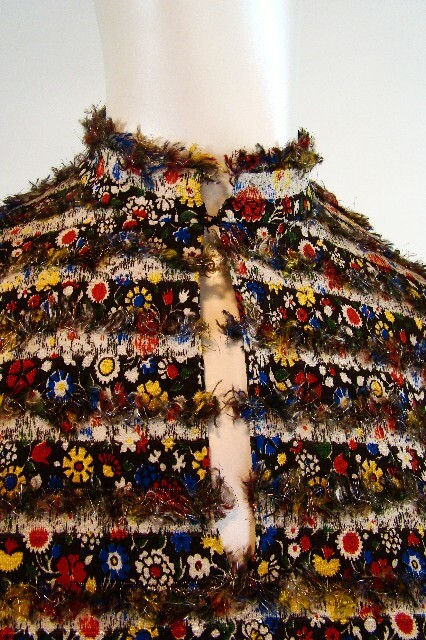 The fabric is constructed so it has rows of "frayed" ruffles – but they are really the edges of the fabric. You might know how to describe this better then me actually, being the fabric queen of the internet! The whole gown is shot through with gold lame threading and it is awe inspiring to see in person. The seams are so well done you have to look from the back to see them! Its pricey but its worth every penny – it's the equivalent to a couture piece really – so not so expensive of you think of it that way. It looks like it should have a label in it crediting it as a Chanel piece doesn't it? Its just an truly incredible textile! Since I am biased and think every piece is amazing, I am always in awe that stuff does not get snatched up right away of course, but honestly, I think its the great little black dresses that run through the site. Every girl should have one (or more) in her closet but its so hard to get the look and feel of a garment on-line I guess and black is the toughest to portray. I am also a little sad sometime to see the terrific little day dresses sit. People tend to think of vintage as special occasion wear, but shouldn't every day you are healthy and happy be a special occasion? Don't wait for occasions to wear vintage girls, wear it because it makes you feel special THAT day! So many things – the greats of course, a Vionnet gown or a Fortuny piece; a runway Dior piece from the 50s; a closet full of Thea Porters … sigh. Honestly I just want to find a dozen mad collectors who have rooms and rooms of pristine, fabulous priceless vintage who all, for some unknown reason, decide I MUST be the girl to own it all! I told you I was clothes crazy! I am am not completely greedy though – anything that did not fit or was the wrong color would promptly go onto Shrimpton Couture! The quality, the wit, the workmanship, the fabrics, the strong emotion a great design can create from nothing, how it feels when you slide on a dress from 40 years ago and it whispers to you in the voices of its past owners. The privilege of meeting women who owned and wore the pieces originally, and having them share their memories with me of that dress and that time in their lives when they had nothing but hope. "Where do you see your site going and do you offer additional services?" To which I would reply, that I hope to make it better and better! That it continues to showcase some of the best vintage out there, in fabulous condition and wrapped up in great client service! We also do personal shopping for clients looking for special pieces, or designers, celebrities or stylists that need more privacy – this is all done through custom built password protected pages on the site! And there is a lightbox icon on the site you can use to catalogue and save your favorite pieces. And above and beyond all of that, soon, as I mentioned above, you will be able to shop by appointment directly with me! 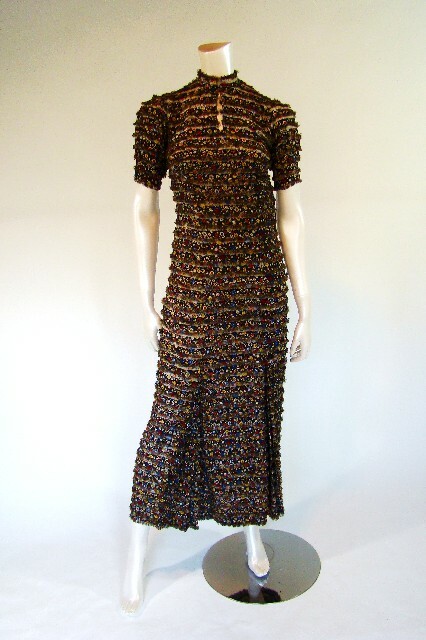 Wendy Brandes' Blog, Style.com, Bagsnob, Couture Snob, Vintage-A-Peel, Zuburbia, do we have room for the other 200 or so? That I was an absolute, total geek in high school. Thick glasses, skinny as a rail, nose in a book, bad style, geek. And that under certain circumstances, despite being able to put together a pretty damn good outfit these days, my inside me can still feel quite overwhelmed by it all and resort back to awkward, shy geekiness. Cherie is also running a contest for a $300 shopping spree on her site … today is the last day to enter! That is a FASCINATING garment! I’ve seen that technique used as trim, but never covering an entire dress. Wow.I pick up lots of vintage items in thrift stores for my sister, who’s quite tiny, and people must have been smaller then. (I’m 5’8″ and she’s 5’3″) At first she wasn’t crazy about them, as she’s not naturally drawn to the Glamour Girl look, but then it turned out her husband LOVES seeing her in them. So she said to keep them coming. I sent her one beautiful wrapped column sheath in violet satin (very Rita Hayworth) and she wore it to a fancy Valentine Ball and got raves. And the things that don’t work for her she passes on to her girlfriends, which gets her extra brownie points. She says the dresses I send especially come in handy for attending weddings, where it seems you always want to buy some new dressy outfit. I love seeing the pics she sends me when they get worn : ) Also, my niece seems to be a reincarnated drag queen who will only wear pink, and she loves seeing her mommie get dolled up. So I am doing my part for the Next Generation. Viva la Coco! Lovely interview! From a fellow Canadian, also in Toronto, Shrimpton couture’s collection is fabulous. Wow. Wait. Let me say that again. Wow! That dress is astonishing! I would have sh!t if I came across something so sublime. It’s wonderful and it’s also wonderful to meet you and see your collection. That’s an incredible, amazing dress. I’d have a hard time letting that one go if it was anywhere near my size!It’s so nice to find out more about some of the fellow vintage stylists and dealers through this blog.Thanks! Cherie is the best. I have incredible pieces from her! anonymous butterfly says…to all of you ladies looking for the dress pattern from butterick 7272 where one lady is wearing a blue strip the other lady is wearing a white one…I found one very close to it, except it doesnt have a collar—type in thishttp://www.butterick.com/item/B5209 then click search…..the one wearing the floral dress with a pink hat view B. I thought it was very close to the one were looking for myself other than it doesnt have the collar…I ordered it Im anxiously waiting for it to get here!